The Kessil A350W (Wide) is a powerful 90w aquarium LED light with two spectra that can be adjusted by manually tuning two knobs: Sky Blue and Deep Ocean Blue. Coverage area of 24" in diameter and 3' of penetration for your aquarium. *For a limited time, purchase a Kessil A350W LED Light & Receive a FREE Kessil A350 Gooseneck. Be sure to read our overview of all Kessil Products, the Everything You Need To Know About Kessil LED Grow Lights, where you can read reviews, compare products, and learn about Kessil's unique LED technology. As with other Kessil LED aquarium lights, the Kessil A350W Wide Angle Dimmable Tuna Blue 90 Watt LED Light has a densely packed LED array. As with the A350 "Tuna Blue" light you can manually adjust the mixture of blue and white LEDs (using the two knobs on top of the light) to find the optimum spectrum for your tank and corals (thus, Tuna Blue or tune the blue). 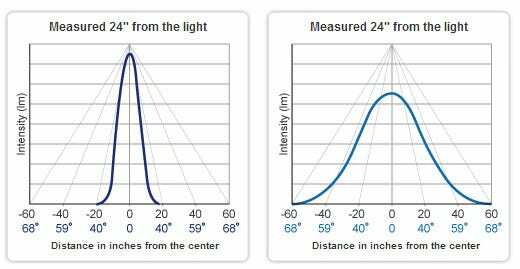 This light is differs from the A350 in that the A350W Wide Angle spreads the light out into a much wider area (see charts at the bottom of the page for the light spread of this wide angle light). The Kessil A350W Dimmable Tuna Blue 90 Watt LED Light brings out the vivid colors of corals with the specially created spectrums of the A350. While it is hard to compare the Kessil to 250 Watt metal halide lights, the 90 Watt Kessil has a greater effective light spectrum for corals than a 250 Watt metal halide. This is partly due to the efficient use of electricity with LEDs, partly a function of higher percentage of the light being directed downward and partly because a very high percentage of the light spectrum with the Kessil A350 Dimmable Tuna Blue 90 Watt LED Light is useful to corals. The Kessil A350W will result in thriving corals with lower electricity bills, less of a need for a chiller and no bulb replacement costs. The lightweight Kessil light, which weighs just over a pound, can be easily hung above the tank from with the two built in mounting tabs (that can be attached to a chain or other hanging mechanism), or can be clamped to the tank with the Kessil A350 & A350W LED Light Pendant Gooseneck Clamp/Mount. This Wide Angle Model has a beam spread of 70 degrees vertically (140 degrees edge-to-edge) and is recommended for larger tanks that are relatively shallow (e.g. frag tanks), and for very large swim tanks. In most instances the A350 will be a better choice than the A350W for reef aquariums. 11.5 foot power cord from light to power supply (a 5 ft cord & a 6.5 ft extension). 6 foot cord from power supply to wall plug.